Get the real ROI on small attractions and 4 tips for picking the right one. You don’t need to take up a ton of space to boost your bottom line. Small attractions can pack a big punch and deliver incredible ROI if you’re smart about it. unused space can produce $400,000 or more annually." We talked to Phil Showler, the Director of Sales at Amusement Products, in advance of the FEC Success Institute about how FECs and other amusement facilities can increase revenue. His answer: Small attractions. Read on for some trade secrets and get Phil’s top tips for selecting the right attraction for your business. Question #1: What do you think most FEC operators have in common? Operators are always looking towards what’s next. I like to think of it as the search for the shiny red ball. The obvious link is that the red ball, of course, brings forth a great visual of what captivates attention. A bouncing and very red and shiny ball allures one’s eyes, emotions and provokes action…Go GET IT! We are always striving to grow and improve to attract new and repeat guests. This can be with considering renovations, new attractions, or even in the best practices and values that we bring to running our businesses. Question #2: What’s one way you think business owners get it wrong? Too many times I’ve visited locations that have underutilized or incorrectly utilized their square feet. Dead space in a location is flushing dollars down the toilet every hour that your location is open. In today’s very product innovative environment, there’s no reason any more for this to be the case. It’s important to consider the endgame. toilet every hour that your location is open." What is the endgame of a location owner? It’s to optimize every square foot of his or her location in terms of revenue. Any time an owner can take otherwise unused or seemingly unusable space and install small attractions that brings huge revenue potential, then most assuredly that attraction becomes the shiny red ball, and FAST! The trick, of course, is determining the right small attractions. Ones that are affordable and can get you a tangible ROI. 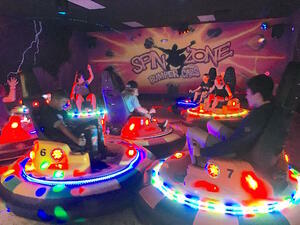 Spin Zone® bumper cars are popular small attractions that work well for many locations. Question #3: How much revenue can you really make with small attractions like Spin Zone? With a simply constructed arena, you could drop it into a 25’x25’ space (625 square feet) and you now have a totally immersive, visually stimulating small attraction. At $3 or $4 a vend for a 2-minute, intensely fun ride, the revenue adds up quickly. You’ve turned that small space into something great. Multiply that vend price times 6-8 cars, times 25 turns per hour, it becomes easy to see how small attractions in what might otherwise have been unused space can produce $400,000 or more annually, paying for itself quickly, and much more! This is estimating 30% utilization for a typical location-based entertainment center. they can use the small attraction—and you can gain revenue." Remember that installing a small attraction close to a redemption center or between the redemption center and a laser tag arena, or VR arena, will allow you to capture dollars from a non-age discriminating attraction. Rather than guests just waiting for their turn at larger attractions, or simply waiting for friends or family members, they can use the small attraction—and you can gain revenue. This also improves overall guest satisfaction because they’re focused on fun, not on the wait, prompting them to stay longer. Return varies, of course, with location hours, other attractions on site, operational aptitude, etc. but you get the idea. Question #4: What’s the future for small attractions? Are they here to stay? Absolutely. As a terrific example of the viability of these small attractions, the advent of BEC’s (bowling entertainment centers) over the past 10 years, has brought industry manufacturers to stand at attention and realize the great need for such a “shiny red ball”. Many BEC’s have opted for pulling out several lanes to optimize the square footage with small attractions like Spin Zone or something of equal value. Our industry is healthy, but for it to remain so, operators and manufacturers alike have to re-invent ourselves every few years. We need to shake up the status quo and deliver out of home experiences that wow guests. If we are successful in doing so, guests of these locations stay longer, spend more and return more often. Question #5: Any tips for picking the right small attraction? The small attraction should take up between 600 and 1200 square feet (plus or minus a few feet). There should be a proven ROI track record of the small attraction supplied by the vendor/manufacturer with return showing in 18 months or less. Make sure the small attraction doesn’t compete with in-home entertainment for best return potential. Understand that common sense is a great tool but, in our business, it doesn’t always help us pick the right tools for our craft. Emotion gets in the way. Consult an industry professional, attend some of the great educational forums available to you, chat with operation owners that are most like you then make your decision, and GO for that shiny red ball! Phil Showler is the Director of Sales for Amusement Products. Reach out to Phil at phil@amusementproducts.com. Interested in attending the next FEC Success Institute in Chattanooga, TN March 5-6? Sign up for your chance to attend on us! We’ll be there, too!